NORMAN, Okla. — He can flat-out fly. That's where the story of college football's most dangerous player begins and ends. Oklahoma wideout Marquise Brown runs like few others can. On a field full of players whose careers depend on speed, he's an uncatchable blur. So fast that when you watch him run, you can't even imagine how anyone ever doubted he would be a big-time college player. Or a big-time NFL player, for that matter. So fast that when you watch him run, you forget all about what was supposed to prevent him from being the player he is. That he's listed at only 168 pounds—a weight that must have been recorded when he was soaking wet and a weight that is actually up about 30 pounds from where he was when he graduated high school. Don't expect to hear any comments from opposing coaches about Brown's size now. Ask about him, and all you'll hear about is that speed. "He gets the ball even or behind you," Baylor coach Matt Rhule says, "and you may as well strike up the band." Two years ago, Brown couldn't get a sniff from coaches like Rhule. He was working at Six Flags, playing junior college ball at College of the Canyons in Santa Clarita, California, and his coaches there had to beg FBS teams to come look at him. When they finally did and he walked onto the practice field for an audition, took off his work uniform, stripped down to tights and revealed a 5'9", at-the-time 140-pound frame, the size seemed an insurmountable problem. Then he ran a 4.33 40. "After that," Brown says with an ear-to-ear grin, "everybody wanted me." He's been the fastest guy on the field since he was five. Back in his Pop Warner days, he used to purposely fumble because he was smaller than everyone and had to gain an advantage. He'd fumble, getting the defense to overpursue, hen he'd sprint to the end zone—that grin the only thing beating him there. He tore it up in high school but only had one offer, from Utah State, and even that fell through after he qualified late. He sat out a season and found his way across the country from his Hollywood, Florida, home to College of the Canyons as a last-ditch chance. Then one 40 time left a bunch of grown men with bug eyes and stopwatches wondering how they'd ever missed him. "We weren't worried about his weight," Oklahoma coach Lincoln Riley says. "Once you see him run, you figure out a way to make it work." "Let's see," says Oklahoma quarterback Kyler Murray, himself one of the fastest players in college football, and a guy who this summer signed a multi-million-dollar contract with the Oakland A's to play baseball, in part because of that ridiculous speed. "I'm not sure how to answer that." "Faster than you?" he's asked. "I'd give him a good run in the 40. Might even take him," Murray says, laughing. "After that, forget it. He's running away from everyone." There's no way to sugarcoat this, though: On first glance, Brown looks like the guy your friend brought along to a pickup game—like someone you'd let play because We need a body, he wants to play, why not? Only that wasn't Marquise Brown. Ever. "The best guy on the field every time he was on it," College of the Canyons coach Ted Iacenda says. This ball of lightning—this surprisingly tough, unthinkably quick grown man in a middle school body—knows how people see him. "I saw the faces when I first got [to Oklahoma]," he says. "They're all looking at me and didn't even think I was a football player. They were the same looks I've seen all my life." Too small in the ultra-competitive world of South Florida Pop Warner football, where they're in pads and play 11-on-11 as five-year-olds. Too small in high school to be worth FBS teams waiting on when he qualified to play for them late in his senior year. May as well find a new career path. "No matter the obstacles, there was always a way out," he says. Without a team in the fall of 2015, he worked out on his own, dragging those cones to the field near his house every damn day to increase his speed and quickness out of cuts and breaks. And he researched the top junior colleges, found College of the Canyons and sent his high school tape. Now all he had to do was convince his mother—who 20 years earlier spent nearly her entire pregnancy on bed rest to keep preeclampsia from potentially killing both her and her son—to let him chase his dream alone in California. He found a room for rent by Googling "room for rent"—yep, he really did—and on the day he landed at LAX, on his own, he went to Six Flags to interview for a job. He earned about $700 a month operating the X2 rollercoaster, and $400 of that went to rent. By the time he paid for bills and essentials, he had about $100 a month for food. Shannon would send money when she could, but Brown wasn't gaining weight. If anything, he was losing it. "Lot of Ramen noodles and cheap frozen foods," Brown says. "I might have gotten under 140 at one point." Then one day, Ethan Lazarek, his teammate and fellow wideout, showed up where Brown was staying—and suddenly, there was another way out. "I look around, and he's sleeping on an air mattress and there's a TV on the ground," says Lazarek, whose family lives in Los Angeles. "I'm thinking, No way, man. No way you're staying here." Lazarek, who had hit it off immediately with Brown when he arrived at College of the Canyons, convinced his parents to allow Brown to stay with them. Free run of the kitchen, free run of anything in the refrigerator. But still, he was hovering around 140 by the time USC, Oklahoma, West Virginia and everyone else who wouldn't look at him two years earlier saw the flash go by that day when everything changed. "His story is insane," says Lazarek, who is now a wideout for Division II Henderson State in Arkansas. "How he got to College of the Canyons, how he figured out how to live, where he lived, everything. From the from the first time I met him, you could just tell this guy was chasing his dream. Size wasn't going to stop him." Everyone seems to have their own you're-not-going-to-believe-this story of the first time they saw Brown. Oklahoma offensive tackle Cody Ford tells his. "Two months later, we're in the first day of spring practice. I see him, and he's just this little guy. First two plays, we run wide receiver screens to him, and he takes both to the house. And I mean, no one was close to catching him. We all looked at each other like, Did you just see that? "We have a lot of fast guys on this team. I've seen a lot of fast guys in this league. No one is as fast as that guy. No one." So fast it may have actually hurt his development. Brown never had to learn the nuances of the receiver position because his route tree from high school through junior college consisted of two options: go and slant. And that was enough. He didn't know a flat from an out, a comeback from a curl. And he sure as hell didn't know anything about a corner or sluggo or reading defenses and option routes. When you're the fastest guy on the field, the object is to get the ball in your hands. That meant his quarterbacks throwing the ball as far as they could and letting Brown run under it. It meant wide receiver reverses and returning kicks and punts. Most of his touchdowns in high school, Brown admits, were on special teams. "They just couldn't catch me," he says. Then Riley had walk-on quarterback Reece Clark teach Brown the offense the day he stepped on campus in Norman. Every play, every route, every option. For three months before spring practice began, Clark and Brown went out and threw three or four times a week for 60 to 90 minutes a day. Brown had to learn how to release and how his routes impacted other routes. "He about threw [Clark's] arm out," Riley jokes. Meanwhile, Brown began the process of gaining weight—only now, it wasn't nearly as difficult. He hadn't eaten properly for the first 20 years of his life. Now he had nutritionists working with him on how to put on weight smartly and with purpose. He also started lifting weights for, he claims, the first time in his life. "My mom worked so hard for us, and she was fortunate enough to just get us dinner," Brown says. "In the morning, we'd probably have some cereal, and then you don't eat again until dinner. Then I got to junior college, and I was only eating from the dollar store. I get [to Oklahoma], and I'm eating like a king. I didn't even have to think. 'Here's what you eat. Here's when you eat it. Here's when you lift weights.' Next thing you know, my body is changing." By the time fall camp rolled around eight months later, Brown had gained nearly 30 pounds—and decreased his body fat. The transition to the field, though, wasn't as quick or easy. Oklahoma's coaches didn't trust Brown to run the correct routes, and more important, neither did star quarterback Baker Mayfield. Brown showed a glimpse of his potential with a six-catch, 153-yard game against Tulane in Week 3 but averaged only three catches and 38 yards the three weeks after that. Mayfield kept working with Brown and pushing him to be ready. His time to show more than just glimpses was coming. It arrived on Oct. 21 of last year. With the Sooners trailing Kansas State 21-10 at halftime, Riley moved Brown into the starting rotation for the second half. He finished with six catches for 126 yards in a 42-35 win. He has been OU's most dangerous threat since. "I pushed him. I absolutely did," Mayfield says. "I like the guys that aren't exactly the prototypical size, where everyone says, 'You can't do this or that.' We definitely had a connection." Brown became an undeniable national star with last year's Bedlam game, a wild, defense-optional contest in which Oklahoma simply outscored rival Oklahoma State 62-52. It was in that game that Fox Sports play-by-play announcer Gus Johnson—he of the hypnotically hyperbolic calls—nicknamed Brown "Hollywood" after his hometown. Brown had long touchdowns of 84 and 77 yards, the 84-yarder on a simple slant (three defenders had the angle on him, and none could catch him), and the 77-yarder on a deep ball where Oklahoma State decided to cover Brown with no safety over the top. Before the ball even reached Brown, who had beaten cornerback Rodarius Williams badly, Johnson began screaming "Hollywood!" "Who is this kid?!" Johnson screeched. Here's the thing about that now-perfect nickname, though: He already had one. His friends have called him "Jet" since he first started playing. "Yep. You know, fast as a jet," Brown says. "Jet," he says. "But Hollywood is kind of cool, too." And being known widely by either is certainly a long way from being known as the receiver who didn't fit the mold. Fast enough to remind one NFL scout of a player with a familiar last name and build: The Steelers' 5'10", 181-pound human highlight reel, Antonio Brown. He was also overlooked coming out of Central Michigan before becoming maybe the best receiver in the league. "Antonio was a sixth-round pick. I can guarantee that Marquise will not get out of the second round without getting picked—and will more than likely get picked in the late first," the scout says. "You run like he does, and that's just too hard to pass up. "You can't make a guy faster, but you can teach him the game." Three years ago, Brown's high school coach told him he wouldn't play college football at 140 pounds, no matter how fast he was. In fact, the coach told him, he could probably get to 180 and not play. "I'm not letting anyone limit where I can play," Brown says now. "I don't worry about size or getting hit. You can't hit what you can't catch." That's how fast he is. Matt Hayes covers college football for Bleacher Report. Follow him on Twitter: @MattHayesCFB. 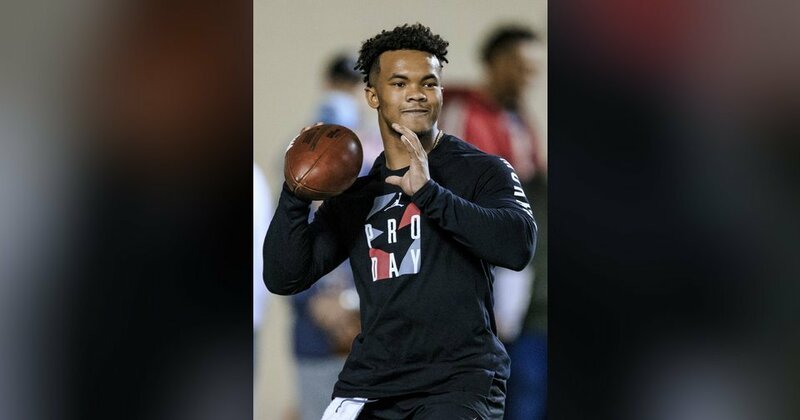 VIDEO: Is Kyler Murray really going No. 1?